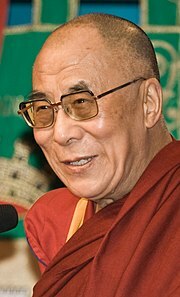 Lama (Tibetan: བླ་མ་, Wylie: bla-ma; "chief" or "heich priest") is a teetle for a teacher o the Dharma in Tibetan Buddhism. ↑ "Online Etymology Dictionary". Etymonline.com. Retrieved 2013-07-17. This page wis last eeditit on 26 November 2018, at 20:04.